An Echocardiogram, also known as a transthoracic (meaning viewed through the chest) echocardiogram, Echo or Echo Doppler, is an ultrasound of the heart. It is a simple procedure that requires no preparation on the part of the patient and does not use any radiation to produce the images. This test is used to view real time images of the beating heart and the blood flowing through it. 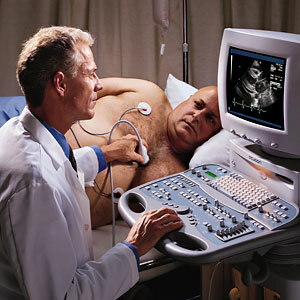 This produces the ability to measure whether a proper amount of blood is being moved through the heart at a proper rate. It also shows if there are any defects in the actual heart muscle tissue or the valves. This procedure involves the patient laying on a table, getting some warm gel applied to the chest area and having the technologist move a transducer wand around in that gel while measuring heart function. It is non-invasive and completely painless, and so safe that it is often used on pregnant women and infants. The purpose of this procedure is to get an overall view of everything going on in the heart, including the size and shape of the heart, blood flow and any congenital defects such as prolapsed valves. An echocardiogram can show the cause of a heart murmur or arrhythmia, tissue damage to the heart, backflow of blood through improperly closing valves (regurgitation), and much more.